WASHINGTON — NASA needs to fly an additional space shuttle mission to the international space station next year because development of privately owned rockets and spacecraft designed to ferry cargo to the orbiting outpost is likely to be delayed, according to the agency’s top official. NASA plans to retire its fleet of space shuttle orbiters next year and rely in part on commercially operated space transportation systems to deliver cargo, and eventually astronauts, to the space station. However, development of cargo delivery systems under the agency’s Commercial Orbital Transportation Services (COTS) program is taking longer than expected. Currently there are only two shuttle flights remaining on the official manifest, one scheduled for Dec. 3 and the other slated for February. But in October, U.S. President Barack Obama signed into law a bill that authorizes an additional mission to take place in June, though it remains to be seen whether congressional appropriators will provide the necessary funding in a 2011 spending package anticipated in the coming months. Bolden’s comments were detailed in a transcript of the all-hands meeting obtained by Space News. His remarks covered myriad programmatic and policy issues, touching on plans to reduce facilities within the agency, build a new heavy-lift launch vehicle and implement management changes designed to curb cost growth on the James Webb Space Telescope, and the potential for future cooperation in human spaceflight with China. Bolden also said the impending Republican takeover of the U.S. House of Representatives at worst could translate to lower spending for NASA programs than was authorized in the 2010 NASA Authorization Act, which calls for spending $58 billion over the next three years. However, he assured the agency employees that such fiscal constraints would not be devastating and that the agency could adapt. “We’re going to look at it and we’re going to make determinations as to what we think we can realistically do. And what we don’t think we can do is going to come off the table,” Bolden said, referring to the authorization law. In addition to the additional shuttle flight, the measure directs NASA to extend space station operations to 2020, begin development work next year on a new heavy-lift rocket, build a multipurpose crew capsule, continue to support the commercial spaceflight industry, and boost spending on Earth science and technology research and development. However, Bolden said NASA would be unable to do everything that Congress and the president have called for. “We are going to have to go and tell them, ‘Great idea. We can do that. But if we do that, we can’t do this,’” he said. Bolden said Congress likely will not pass new spending legislation before March. In the meantime, NASA and other government agencies would continue operating at 2010 funding levels under a series of stop-gap spending measures known as continuing resolutions. Although NASA expects to terminate its Constellation program, a collection of hardware development efforts geared toward returning astronauts to the Moon by 2020, some elements will be salvaged, Bolden said. These include the J-2X upper-stage engine whose development is overseen by Marshall. “The J-2X undoubtedly will play a critical role, not just in NASA but probably across the national front in terms of providing an upper-stage capability,” Bolden said of the engine, which is being developed by Canoga Park, Calif.-based Pratt & Whitney Rocketdyne. “The big question for us is what do we use for a first-stage engine,” Bolden said, adding that the choices include engines fueled by liquid oxygen and liquid hydrogen, or by liquid oxygen and liquid kerosene. “It seems real simple but it’s not. It makes a big difference in cost,” he said. Under the NASA Authorization Act of 2010, NASA is directed to build a heavy-lift launcher next year that is ultimately capable of lifting at least 130 metric tons to orbit, a performance requirement some experts assert can be best achieved using solid-rocket motors, such as those built by Minneapolis-based Alliant Techsystems (ATK) at facilities in Promontory, Utah. Members of Utah’s congressional delegation came away from a Nov. 18 meeting with Bolden and NASA Deputy Administrator Lori Garver questioning whether the agency intends to comply with the NASA Authorization Act’s guidance on heavy lift. Although NASA is currently evaluating options for a deep space exploration architecture, including designs for a heavy-lift launch vehicle, the agency recently awarded 13 contracts with a combined value of $7.5 million to study design and propulsion alternatives for a heavy-lift launch system. The awardees represent a broad cross section of the U.S. rocket industry, including ATK. Bolden said that while cost and technical issues are important, politics would play a role in the heavy-lift launch vehicle decision as well. 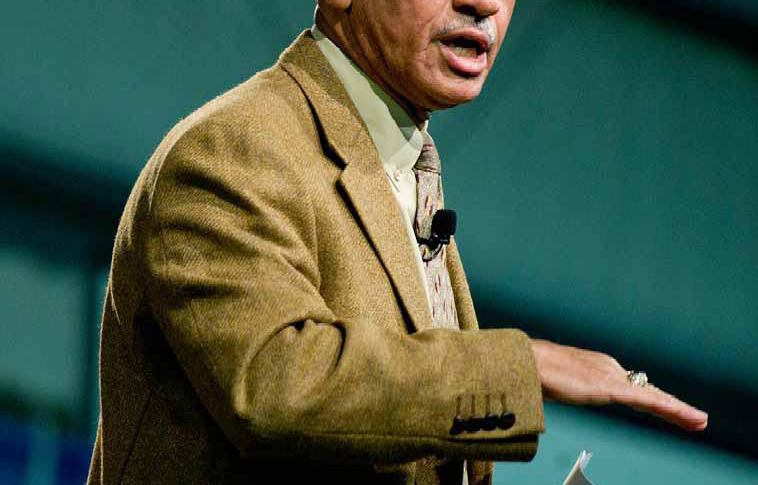 During a question-and-answer session following his remarks, Bolden was asked to account for new cost growth and schedule delays on the James Webb Space Telescope (JWST), NASA’s next-generation flagship astronomy mission and successor to the Hubble Space Telescope. The program is facing a minimum $1.5 billion cost increase that could affect funding for other space science priorities. In addition, it is expected to launch at least 15 months behind schedule, according to the findings of an independent review released in November. Bolden said NASA is trying to “get a grip” on the program by moving it from within the agency’s Astrophysics Division into a new program office at NASA headquarters. He also said a “bottoms-up review” of expected cost and schedule concerns is under way. Bolden said the agency should have gone to Congress sooner with its JWST funding woes.